This Dutch student's college project led to him driving around the world in a Volkswagen Golf that runs on electricity! A road trip around the world without spending a dime may sound impossible to many but a Dutchman from Netherlands has been doing so with relative ease and for a good cause. Wiebe Wakker has been zigzagging through countries in an electric car without any funds for the last one year, to spread the message of global environmental sustainability. The only source of sustenance for this traveller is people's generosity. Wakker began his road trip project, Plug Me In, from Netherlands in March last year as a part of his university project to understand the concept of sustainability. Arriving in India last week from Dubai, his final destination, Australia, is now only four countries away. The idea for the trip struck Wakker in 2009 when he travelled to Australia for a year and read books by a fellow traveller on unique road trips. He then decided to do something similar at least once in his life. Wakker is a student of the HKU University of Arts in Utrecht, a city in the central Netherlands. He wanted to do a graduation project on the importance of sustainability and decided on an interesting road trip to explore the concept. Wakker, though never a car enthusiast, was fascinated by the electric cars that captured the imagination of the Dutch in 2014-15. "I thought that it was a great tool as it was extremely fast and made no noise. It was kind of a new thing and I thought I would be doing something unique by travelling to the other side of the world in it," says the 29-year-old. It took him a year and a half to organise the road trip, right from finalising the concept and getting sponsors to creating a website. The hardest part though, was to find a car. But while looking for a sponsor, Wakker was lucky to meet Marcel Peters, a Netherlands-based businessman, who drove around in a modified electric VW Golf (Volkswagen Golf). Excited by the concept of the road trip, Peters allowed Wakker to borrow his car for the journey. In fact, the car which was originally a diesel model, was modified into a fully electric model by a company called Electric Cars Europe. The vehicle has a 37 kWh battery, a range of 200 km and a top speed of 260 km/h. It goes from zero to 100 km/h in nine seconds, informs the traveller. 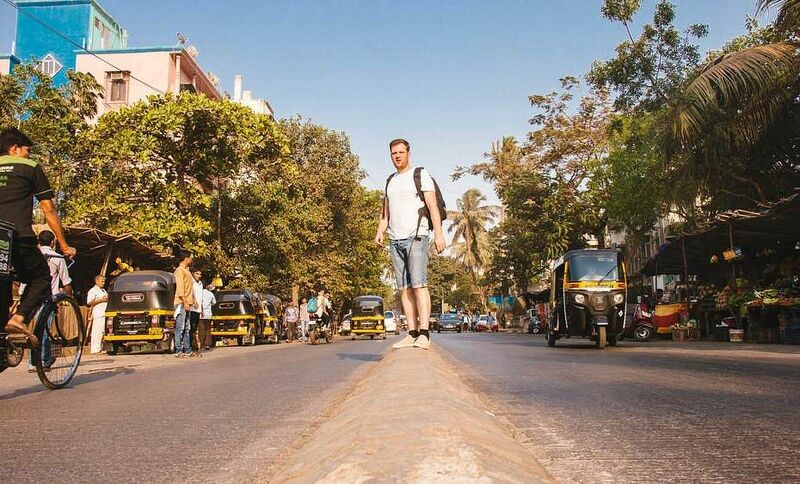 The road trip began on March 15, 2016 and now 41,000 km, 24 countries and 397 days later, Wakker continues to cross countries, the latest being India, to reach his destination. He does not carry cash with him and relies on people, who offer him energy through social media. "My website (www.plugmeinproject.com) offers people the opportunity to select their location and ‘plug me in’ with a meal, place to sleep, or energy for the car," he says. Based on the offers, he will plan his route to Australia. This is also the reason why he does not travel on a definitive route but zigzags his way through countries as and when he finds help from the locals. Talking about the need for money, Wakker says that although he requires funds occasionally for visas, he collects money by doing odd jobs. "Recently, when I arrived in the UAE, I needed money to ship the car to India. So, I found a job in Dubai and was lucky to find a company that agreed to ship the car up to Mumbai," he says. More than 750 people from over 40 countries and four continents have offered their help to Wakker online and at least 250 people have helped him personally. So how has the journey helped in spreading the message of sustainability? "The fact that I drive around the world in an electric car alone already spreads the message on sustainable mobility. It shows the advantages of electric cars and people learn a lot about such cars, especially as I travel through countries were no one has even seen an electric car. In the countries that I travel through, I visit a lot of organisations and companies that are pro-sustainability and I make movies about their initiatives. These movies have incredible reach; one video even reached 4.6 million views. This helps bring awareness to the project," he says. In India, he travelled through Mumbai and visited the rag-pickers of Dharavi, which is one of Mumbai's most well-known slums. "Despite the poverty, it has an interesting business model: recycling. Around 650 million US dollars are generated annually through recycling of plastic, cardboard and paint barrels. I interviewed the CEO of Reality Tours and Travel who told me that Dharavi is the 'green lung' of Mumbai as it manages the waste system of the city," he says. The journey so far has brought him many unique experiences like a free helicopter ride, staying in five-star hotels and luxurious desert safaris arranged by Sheikhs. It is, however, the people who make his journey worthwhile, believes Wakker. "It’s the kindness of people that makes this trip special and keeps me going. I find it heartwarming that there are so many people who want to help me reach my goal. In Iran, more than 100 people offered their help and the way they received me into their homes was truly special," he says humbly. He has been lucky to stay out of trouble most of the time, except while trying to get a visa for Iran from Eastern Europe during the winter. He did not want to stay in East Turkey or Iran during the season due to the harsh weather, which is not good for an electric car. "I needed to get my visa and for that you need a code from a tourist company in order to apply for it. I found out quite late that the company was fraudulent. I had to start the process again and I lost two weeks. Then, I read in a blog that some people had got their visa for Iran at the border. While people were skeptical, I decided to take my chances. However, I was unlucky as there was no way I could get a visa at the border. I had to drive back to the Consulate in Erzurum and this took three days and it had already started to snow. But I had to keep going even though I couldn’t turn on the heater as the tyres were in bad shape. This was the scariest two hours of my life. Luckily, I made it to a fuel station, where I could recharge the batteries and continue to the next village." Now we wonder if there’s been an occasion when he hasn’t been able to charge the car. With confidence, Wakker replies, “Never!” The good thing, he says, is that electricity is everywhere, so he can charge anywhere, be it a small shop or a fuel station on the highway. There was only one instance when he ran out of battery in Poland while it rained hard. Wakker had to wait on the highway for 45 minutes till someone stopped and towed him to the next fuel station. This week, Wakker will be starting his journey from Mumbai to Bangladesh via New Delhi. "I expect India will be the toughest part of the journey as there could be a lack of electricity and I have been warned about the traffic too," says the sustainability activist, who will return to India from Bangladesh to enter Myanmar. "This will be a challenging lap as I would need a guide and government official with me to get border clearance. Following this, I will cross Thailand, Malaysia, Singapore and will eventually ship the car from Indonesia to Australia," he says, signing off with a smile.